Today’s kitchen appliances all perform the same basic functions – they cool, clean and cook – but there is a world of difference and innovation between them. Technological advances are dramatically affecting their form and function. No sooner has one idea swept the showrooms (LED refrigerator lights, self-cleaning ovens etc), then another is upon us (steam ovens, sous vide). Here are the 5 hottest trends in kitchens today. Be warned, though. These are liable to change. Having kitchen appliances that communicate with one another and their owner is dramatically changing traditional ideas about the kitchen. When appliances are invented (and surely it won’t be long) that are able to prep food and self-cook, then the concept of a remote kitchen will become a reality. However, until that day arrives, we will have to prepare our own meals while our appliances talk quietly amongst themselves. All companies have their own marketing terms for these functions. In the case of GE, it’s called ChefConnect, which allows ranges, hoods, and over-the-range microwaves to sync via Bluetooth. Many higher-end appliances are smartphone compatible and can be controlled by apps and by in-home virtual assistants such as Alexa and Siri. Some companies have gone a step further. 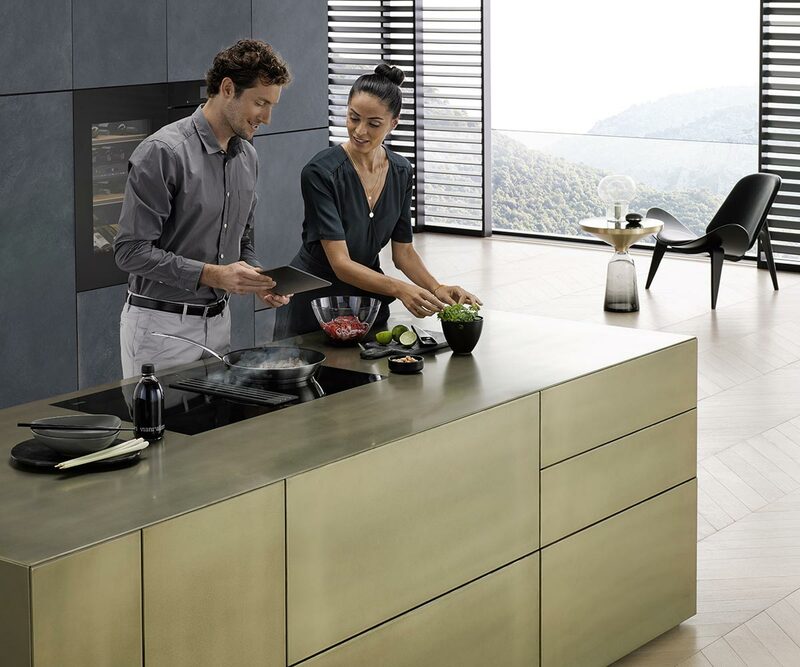 Miele even allows you to start appliances remotely so things are ready to go as soon as you enter the house using the Miele@mobile app on your smartphone or tablet. For the health conscious, a steam oven is an essential purchase. They cook much faster than conventional ovens, and because only steam is being used to heat food, succulence and nutritional value is at a premium. The actual concept of cooking with steam isn’t new. It was popular in ancient China and as far back as the 18th century in Europe. However, its newest incarnation, in luxury appliances as opposed to bamboo baskets, comes on the back of the health boom. In most steam ovens water boils and steam is captured and held at variable temperatures ranging from 212 degrees Fahrenheit down to 85 degrees Fahrenheit. Many steam ovens combine different modes of cooking, including convection and conventional which allows greater versatility when preparing an array of dishes. One of the most often used modes for steaming is, obviously, the “Steam Mode” which is perfect for poaching fish, steaming vegetables and rice. It’s also useful for reheating leftovers and defrosting frozen foods. No matter what you’re preparing, you’ll find a cooking function that’s perfect in a steam oven. The iPhone has a lot to answer for. 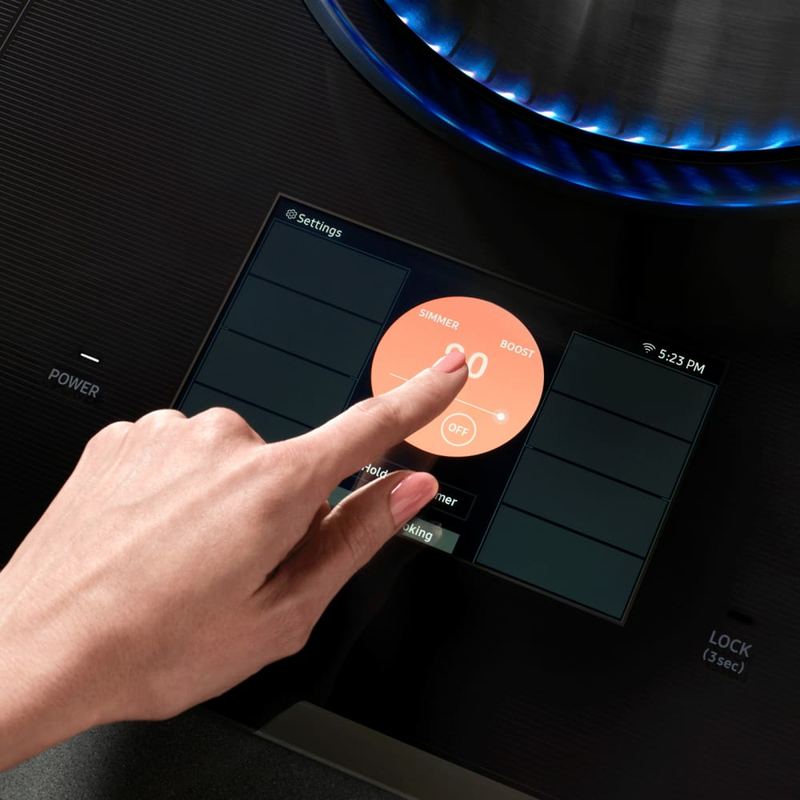 Touch-and swipe LCD controls such as those on Dacor Modernist’s 36-inch induction cooktop, turn kitchen appliances into control centers allowing access to cooking functions, pre-programmed settings and step by step recipes. Although induction cooking has been around a while it still hasn’t taken off in the US where it lags behind Europe in terms of popularity. One of the main advantages its use of magnetic induction which turns the cookware into the cooking surface. This conducts heat to what you’re cooking much more quickly and efficiently. The other main advantage, the lack of exposed gas burners or electric elements, which greatly reduces the possibility of burn injuries. These are a perfect accompaniment to a touchscreen control surface, as with GE Café’s 36-inch Electric Smoothtop cooktop and the afore-mentioned Dacor Modernist36-inch induction cooktop, which combine to create a seamless, tech-centric modern kitchen.